The Library Board of Trustees consists of seven members who are residents of the City of Newton. The Board members are appointed by the Mayor and approved by the City Commission. Board terms are four years and each member may be appointed to two full terms. The Library Director serves as Secretary to the Board. 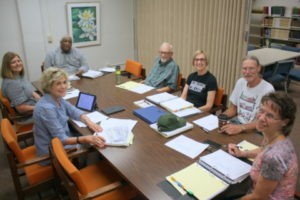 The regular meetings of the Board are held on the second Monday of each month at 5:15 p.m. at the Library, unless otherwise ordered by the Board.